Everything about the lives of Jesse and Mary Whiton-Stuart (builders and first occupants of what came to be called Veblen House) seems to have an interesting twist. Each decade of their lives brings a new adventure. Around 1912, after spending the first decade of the 20th century establishing his real estate business in Manhattan, marrying and having two children, Jesse moved to Prescott, AZ. Here's Jesse's account, from a 1913 update he sent in to Harvard University, fifteen years after his class would have graduated. I left Harvard on account of illness, and travelled when not in or preparing for Williams and Cambridge, England. I saw Russia, Armenia, all of Europe, the Far East three times, the Holy Land, Greece and was one of few that crossed Persia to the Gulf, also West and Africa. I was a real estate specialist for ten years in New York, and am still president of the J.P. Whiton-Stuart Company, New York, where I saved enough to buy a herd of cattle in Arizona. I now live on a horse’s back, riding over one hundred square miles of cattle range I rent from the United States government in the largest forest in the United States. Member: Union Club of New York, Yavapai Club of Prescott, Az. Why did he leave New York? Well, we know from various sources that Jesse loved horses, the outdoors, and adventure. He makes no mention of the family going along, and one description handed down from his years in Princeton was that kids weren't his cup of tea. There's a newsclipping from Prescott's Weekly Journal-Miner, however, that says Mary bought 25 acres close to his in August, 1913. And there's evidence that the kids lived there in another clipping, from 1937. By "a few years ago", they mean 20. Jesse may have already gotten to know Arizona before he got married. His update sent to Harvard in 1908 says he "hunted as an avocation throughout the West." as a specialist in selling large private residences." By seeking hunting adventures out west as a young man, and later leaving New York City to start a ranch, Jesse was following in the footsteps of Teddy Roosevelt, who had written three books about his similar adventures thirty years prior. A National Park Service account tells of how a young Teddy Roosevelt headed west to hunt for bison, and ended up investing in the ranching business just as ranchers were crowding the prairies with cattle to fill the void left by the slaughter of bison. The overabundance of cattle led to overgrazing, followed by a massive dieoff of cattle during an unusually harsh winter. The carnage brought an end to Roosevelt's ranching business, and a new awareness of how human folly could lay waste even the vast lands of the West. For Roosevelt, the experience of hunting and ranching in the Dakota Badlands served as a right of passage to manhood, and spawned in Roosevelt the conservation ethic that would become so prominent when he became president. Jesse, growing up as an only child, tutored in his parents' home on Park Avenue, may have found similar rewards out west. As with the previously unknown Natchez, Mississippi, birthplace of Jesse's wife Mary Marshall Ogden, Prescott gets more interesting the more one reads about it. 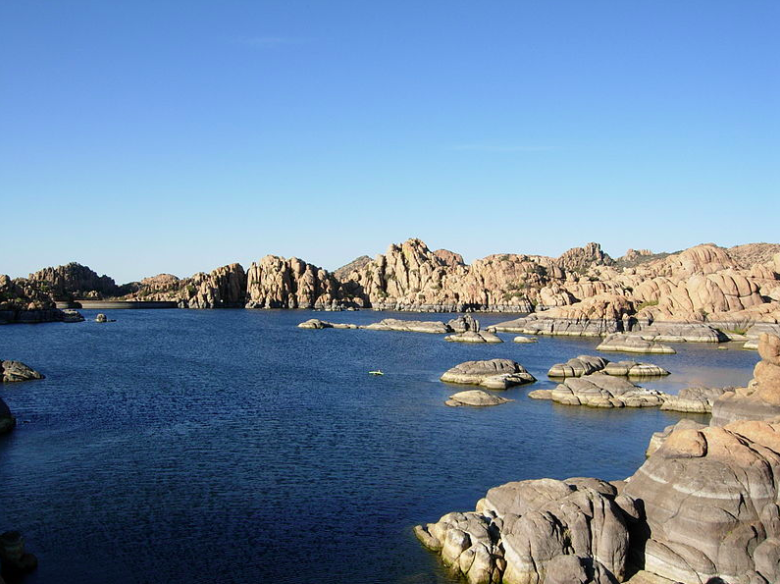 There are distinctive rock outcroppings, and the 1.25 million acre Prescott Forest where Jesse had his ranch. Aldo Leopold, of Sand County Almanac fame, spent the early years of his career, from 1909 to 1924, in that area, writing management plans and handbooks for the forest service, including a report on Prescott National Forest in 1920. Fun facts about Leopold: he was born 80 miles south of where Veblen grew up in Iowa, and moved to the Princeton area a year before Veblen, to go to Lawrenceville School in 1904. In more recent times, long after the Whiton-Stuarts left, an Ecosa Institute that teachers "innovative ecological design" was founded in Prescott by a disciple of Paolo Solari, whose nearby Arcosanti is an experimental alternative to urban sprawl. Frank Lloyd Wright's Taliesin West is another hour south, established closer to Phoenix in 1937. How things went for the Whiton-Stuart family out west is anyone's guess. Inquiries with the Arizona Historical Society and the Sharlot Hall Museum Library and Archives have not uncovered any information about the Whiton-Stuarts' stay in Prescott. 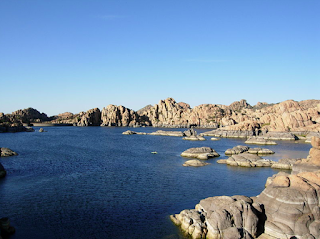 It's probably pure coincidence that a lake in the photo, outside of Prescott, is called Watson Lake, and Jesse's stepfather's middle name is Watson. Adding mystery is a March 17, 1912 notice in the Arizona Republic newspaper of Phoenix that has Jesse living in Tuscarora, Nevada, and in need of various dogs. This fits well with a description handed down from Princeton native Martha Cortelyou ("Marnie") Allen, of Jesse driving around Princeton in a station wagon with three Cocker spaniels in the back. WANTS PET STOCK A Jerome man refers to Harry Welch, secretary of the board of trade, a letter from J. P. W. Stuart of Tuscarora Nevada, in which some local people may take a business interest. Mr. Stuart is desirous of securing a supply of pet stock, almost any kind but preferably dogs. Two Maltese kittens will satisfy him in the cat line but when It comes to dogs his taste is more varied. First he would like an English bloodhound pup. Then he wants two English or Gordon setter pups and a Chesapeake Bay dog pup or water spaniel. He says he does not want them for show purposes from which it is surmised he is more concerned about good blood than fancy points. Any Phoenix man carrying a line of dogs will do well to correspond with Mr. Stuart. By 1920, the Whiton-Stuarts were back east, living in Morristown, NJ. The move to Princeton, along with the prefab house that would later become the Veblen House, would come a decade later. Whiton-Stuart's reports back to Harvard--thus far our only samples of his writing--offer hints of why he and his wife decided to move to the Princeton Ridge lands in the 1930s. By then in his late 50s, Jesse might have been drawn to Princeton's golden age of mathematics, which Veblen had so much to do with, and also the prospect of riding his horses in a part of Princeton that has rock outcroppings vaguely reminiscent of Prescott.